Sports technology company, LongoMatch, and their proprietary software product will be showcased to iSportconnect private network of sports business executives at events during 2015. Founded in 2004 in Barcelona, Fluendo.com is an international company that enables multimedia and video on a wide variety of devices and operating systems. The company recently acquired LongoMatch, a cross-platform software tool that lets users perform real-time analysis on sports game video feeds. LongoMatch software lets users tag plays, review portions of a live game in slow motion and create post-match analysis, all adaptable to a variety of video formats. The software also lets users review tagged events in-game and lets them export the clips while still analyzing the game live. It is currently available for Windows, Mac and Linux operating systems. 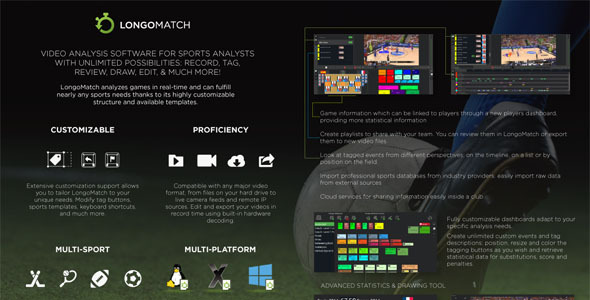 LongoMatch was nominated as one of the 10 best sports analysis systems in the world in the 2013 Performance Video Analysis Software Guide and is currently used all over the world by amateur and professional sports teams, including the Belgium national World Cup football team and the Spanish national handball federation. iSportconnect TV is considered the first TV channel on the web for the global sport business industry. Sports Techie, the world of sports analytics is growing at Internet speed led by sports technology companies such as LongoMatch, specialists with soccer and other Olympic sports. By aligning with iSportconnect, distinguished members can learn about analytical approaches to sports performance, coaching and digital media. If you want additional details or information about products, events and membership, email: contact@fluendo.com and info@isportconnect.com.